This was our first hackathon (for the three of us) so defining the problem was our first challenge. We wanted to do something meaningful, making use of as many sponsors as possible but above all, we wanted to make it work in just 1 day! Having the time restriction in mind, we decided to go with a web-based solution, a world where all three of us feel at home. Ok, now what? That sounded pretty cool to us, but we wanted to take it to the next level. It would have to be easy to use, consume really low resources, only bother you when something fishy is going on and let you quickly take action wherever you were. After all, nobody wants a live stream of their place being robbed if they cannot do anything about it! Awesome, cool idea, easy-peasy. Wait, what? The next step was to structure the project, split the work and code like maniacs! After a record-time discussion about the different alternatives on how to approach this project, evaluating pros and cons, and considering what was among our possibilities, we decided we were going to need a client (aka: the program that would make use of a camera and start a flow or process in case an intruder showed up) and a server to be the glue between the camera, the APIs and the users. We were a team of 3: one needed to take care of the motion detection script; another should create the server and develop the program that would listen to the client and act appropriately; the third should read the sponsor’s API docs, configure the accounts and implement the code to make use of the services. After getting a lot of help from the community and several drained batteries, worn out keys and crossed fingers later…….IT WAS ALIVE! With a small script, we managed to convert a webcam into a surveillance camera which would trigger a call to a server whenever a preconfigured motion detection threshold was surpassed. That call would create a videochat room (thanks Vidyo!) and send SMS (thanks Apifonica!) to every interested party saying that something suspicious was going on and specifying the room URL. After watching the live streaming (audio included), anyone could press the ALERT or DISMISS buttons. In case of ALERT, another SMS with the URL would be sent to a security firm along with a TextToSpeech message (thanks Telestax!) with your information and address. Hold on, did we make it? Really? Is it working? Woohooo! Ok, I’m going hom…no… still one last thing: we have to introduce the crowd to a our brand new software prototype, make everyone love us and want the product. In other words, we need to sell! For many (and I really mean MANY) people, this part would be… I cannot say the easiest, but the most human / planet-earthy step of the this guide. However, for us geeks, believe me, it really was quite a challenge! We would have to step before our audience, introduce ourselves, play the best cards we could, pretend we weren’t nervous at all, and then we would be done. Let’s do it. Sounds easy but it’s not, specially when you find out your presentation is being broadcasted to who knows how many people in who knows what exotic countries (maybe as exotic as ours!). We prepared a very pretty slideshow to serve us as a guide for the presentation, we assigned an equal amount of slides to each member of the team for them to explain, and…let’s get ready to rumble! 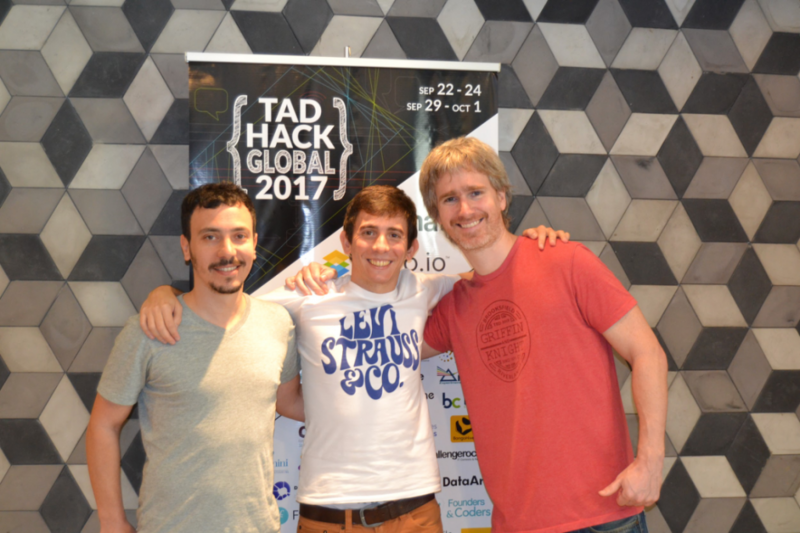 For us, participating on this TADHack event was a fun and rewarding experience, and we are already looking forward to the next one!